‘Tis is the season of transition to summer routines. School and church activities like Bible studies, small groups and children’s programs are wrapping up. It’s a perfect time of year to reflect on those who have had influence on our faith. There are official “volunteer recognition” parties and fellowship lunches, gift cards given and Hallmark cards signed. Whether our expressions of gratitude are official or spontaneous, they are important and powerful encouragement to volunteers who lead Bible studies, teach Sunday School, hold babies in the nursery, serve on worship teams, facilitate small groups, preach and inspire, make coffee, maintain our church buildings, be a buddy to a child with special needs, make meals for families when someone is hospitalized, speak or write words or encouragement, mentor youth, lead our congregations, administrate our offices and pray faithfully on our prayer chains. The list of those who could be thanked and how we might do that goes on and on. Rhonda Roe and her Bible study friends recently found a creative way to thank their Bible study leader, Jan Christofferson. They have so valued the way Jan teaches and inspires them. I want to thank Rhonda for sharing today’s story and poem reminding us to give thanks and inspiring us share our Glory Stories of how we are personally encountering the Living God in His precious presence, power and goodness. My Bible study leader, Jan Christofferson, often refers to what she learned in Sunday school as a small child. She tells us about sitting in little red chairs and learning simple truths about Jesus and stories of faith. 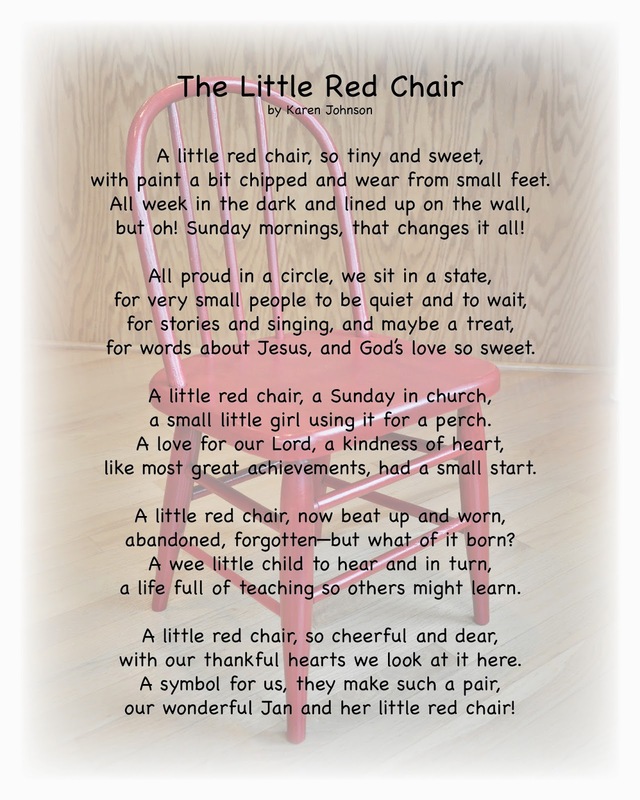 I have often thought how neat it would be to give Jan a little red wooden chair as a reminder of those special days in Sunday school. This year I was able to make that dream a reality. I found a small wooden chair at an antique store and purchased it. My friend, Karen, painted it red and wrote a poem to give to Jan. We recently gave it to Jan at our end-of-the-year brunch. I hope this story and the poem inspire you to share your faith with the children in your lives. You never know if one of them will grow up to have a servant heart and a desire to lead a Bible study. with paint a bit chipped and wear from small feet. but oh! Sunday mornings, that changes it all! for words about Jesus, and God’s love so sweet. a small little girl using it for a perch. like most great achievements, had a small start. abandoned, forgotten—but what of it born? a life full of teaching so others might learn. with our thankful hearts we look at it here. our wonderful Jan and her little red chair! Who might you thank today or this week? How could you do that in a way that is personally meaningful?